For other uses, see Wedding dress (disambiguation) and Gown (disambiguation). 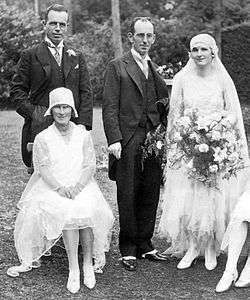 The woman to the far right is wearing a typical wedding dress from 1929. Until the late 1960s, wedding dresses reflected the styles of the day. From that time onward, wedding dresses have often been based on Victorian styles. The first documented instance of a princess who wore a white wedding gown for a royal wedding ceremony is that of Philippa of England, who wore a tunic with a cloak in white silk bordered with grey squirrel and ermine in 1406. Mary, Queen of Scots, wore a white wedding gown in 1559 when she married her first husband, Francis Dauphin of France, because it was her favorite color, although white was then the color of mourning for French Queens. 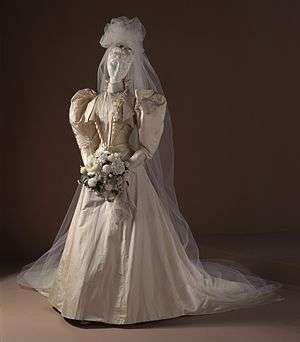 This was not a widespread trend, however: prior to the Victorian era, a bride was married in any color, black being especially popular in Scandinavia. White became a popular option in 1840, after the marriage of Queen Victoria to Albert of Saxe-Coburg, when Victoria wore a white gown to incorporate some lace she prized. The official wedding portrait photograph was widely published, and many brides opted for white in accordance with the Queen's choice. Today, Western wedding dresses are usually white, though "wedding white" includes shades such as eggshell, ecru and ivory. Later, many people assumed that the color white was intended to symbolize virginity, though this was not the original intention: it was the color blue that was connected to purity, piety, faithfulness, and the Virgin Mary. 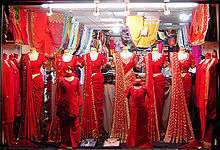 Many wedding dresses in China, India (wedding sari), Pakistan (heavily embroidered shalwar qameez or lehngas) and Vietnam (in the traditional form of the Ao dai) are red, the traditional colour of good luck and auspiciousness. Nowadays, many women choose other colours besides red. 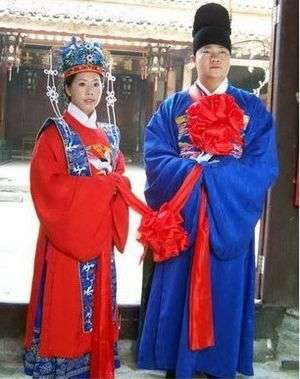 In modern mainland Chinese weddings, the bride may opt for Western dresses of any colour, and later don a traditional costume for the official tea ceremony. Qing dynasty styled traditional Chinese wedding dress with phoenix crown (鳳冠) headpiece still used in modern Taiwanese weddings. In modern Taiwanese weddings, the bride generally picks red (following Chinese tradition) or white (more Western) silk for the wedding gown material, but most will wear the red traditional garment for their formal wedding banquets. Traditionally, the father of the bride is responsible for the wedding banquet hosted on the bride's side and the alcohol (specifically called "xi-jiu," confusingly the same as what the wedding banquet itself is called) consumed during both banquets. While the wedding itself is often based on the couple's choices, the wedding banquets are a symbolic gesture of "thanks" and appreciation, to those that have raised the bride and groom (such as grandparents and uncles) and those who will continue to be there to help the bride and groom in the future. Thus out of respect for the elders, wedding banquets are usually done formally and traditionally. Red wedding saris are the traditional garment choice for brides in Indian culture. Sari fabric is also traditionally silk. Over time, colour options and fabric choices for Indian brides have expanded. Today fabrics like crepe, Georgette, charmeuse, and satin are used, and colors have been expanded to include gold, pink, orange, maroon, brown, and yellow as well. 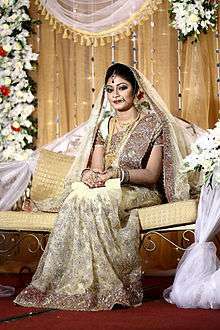 Indian brides in Western countries often wear the sari at the wedding ceremony and change into traditional Indian wear afterwards (lehnga, choli, etc.). 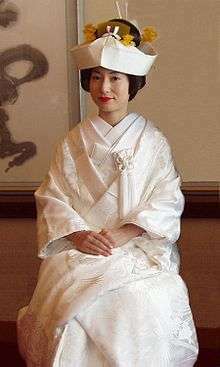 Japanese formal wedding dress still used today. A Japanese wedding usually involves a traditional pure white kimono for the formal ceremony, symbolizing purity and maidenhood. The bride may change into a red kimono for the events after the ceremony for good luck. The Javanese people of Indonesia wear a kebaya, a traditional kind of blouse, along with batik. In the Philippines, variations of the Baro't saya adapted to the white wedding tradition are considered to be wedding attire for women, along with the Barong Tagalog for men. Various tribes and Muslim Filipinos don other forms of traditional dress during their respective ceremonies. 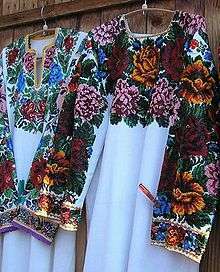 The indigenous peoples of the Americas have varying traditions related to weddings and thus wedding dresses. 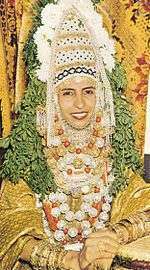 A Hopi bride traditionally had her garments woven by the groom and any men in the village who wished to participate. The garments consisted of a large belt, two all-white wedding robes, a white wedding robe with red stripes at top and bottom, white buckskin leggings and moccasins, a string for tying the hair, and a reed mat in which to wrap the outfit. This outfit also served as a shroud, since these garments would be necessary for the trip through the underworld. 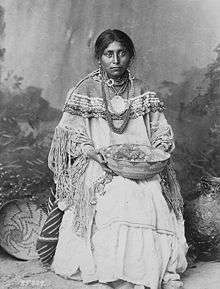 A Pueblo bride wore a cotton garment tied above the right shoulder, secured with a belt around the waist. In the traditions of the Delaware, a bride wore a knee-length skirt of deerskin and a band of wampum beads around her forehead. Except for fine beads or shell necklaces, the body was bare from the waist up. If it was a winter wedding, she wore deerskin leggings and moccasins and a robe of turkey feathers. Her face was painted with white, red and yellow clay. 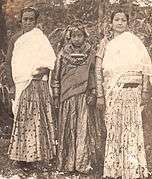 The tribes of Northern California (which include the Klamath, the Modoc and the Yurok) had a traditional bridal dress woven in symbolic colors: white for the east, blue for the south, yellow (orange) for the west; and black for the north. Turquoise and silver jewelry were worn by both the bride and the groom in addition to a silver concho belt. Jewelry was considered a shield against evils including hunger, poverty and bad luck. 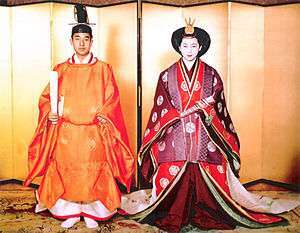 Traditional Japanese wedding robes worn by the Crown Prince of Japan, Akihito and Michiko Shoda for their marriage, 1959. 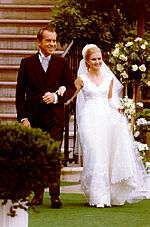 Wikimedia Commons has media related to Wedding dress. ↑ "Mary, Queen of Scots' first wedding day". Retrieved 21 November 2014. Mary’s choice of a white wedding dress was an unusual one, particularly as white was more traditionally worn by royal ladies when they were in dieul blanc mourning but in this as in other things the strong willed Mary may well have been an innovator, keen to not just impress her own taste on her wedding day (after all, she hadn’t been allowed the privilege of choosing her groom) but also emphasise her virginity and show off her famously pale redheaded beauty, which would have been accentuated by a pure white dress. ↑ "Elizabeth I Facts". Retrieved 21 November 2014. Her favourite dress colours were white and black which symbolised purity. ↑ Ashliman, DL (2004). Folk and Fairy Tales: A Handbook–Greenwood Folklore Handbooks. ABC-CLIO. p. 9. ISBN 9780313058592. ↑ Goldstein, Katherine (17 May 2012). "Say Yes to a Different Dress: Down with the strapless wedding gown". Slate.com. Retrieved 29 May 2012. ↑ "Spiffy dresses bring endless beauty". OACHY.